UFC gets the Finest treatment with Topps' latest MMA set. Bringing together such brand hallmarks as Refractor rainbows, autographs and mini boxes, Finest packs a shiny punch. Each six-pack mini-box promises at least one autograph and relic card. Every pack of this hobby-exclusive also has a numbered Refractor in one of several variations. Topps has announced that 75% of the autographs in this release will feature on-card signatures. Two autographed relic and/or jumbo relic cards. Finest Fighters Autographs: 35 fighters sign on-card autographs for the first time. Parallels: Refractors (serial numbered), X-Fractor (/88), Gold (/25), Octa-Fractor (/8), Red (/1), Printing Plates. 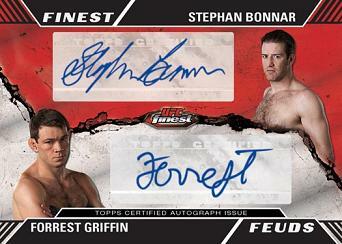 Finest Moment Autographs: 15 autograph cards highlighting specific fighter achievements. Parellels: Octa-Fractor (/8), Red Refractors (/1), Printing Plates. Iron Sharpens Iron: Dual autographs featuring fighters and the training partners (/25). 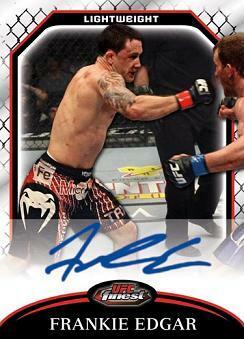 Hatfields and the McCoys: Ten dual autographs highlighting notable UFC grudge matches (/25). Finest Flag-Bearers Autograph Patch Cards: Ten fighters are each given four signed manufactured patch versions honoring their home country. The first three versions contain a signed letter patch that spells out the abbreviation of their homeland, like USA or CAN. The fourth version has the combatant's autograph on a manufactured flag patch. Each of the four versions is numbered out of 25. Finest Flag-Bearers Autograph Books: These one-of-one cards bring together each of the four individual Flag-Bearer patch cards into a single book. Finest Fight Mat Jumbo Relic Cards: Thirty cards, each with a jumbo Octagon mat piece. Parallels: Octa-Fractors (/8), Red Refractors, Printing Plates. Finest Fight Mat Jumbo Autographed Relic Cards: Twenty UFC fighters sign directly on jumbo-sized Octagon mat canvases (/25). Finest Threads Relics: 30 cards with fighter-worn relics pieces such as shorts and shirts. Parallels: X-Fractor (/188), Gold Refractors (/88), Octa-Fractors (/8), Red Refractors (/1), Printing Plates. Jumbo Finest Threads Relic Cards: Fighter-worn relics with large swatches. Parallels: Octa-Fractors (/8), Red Refractors, Printing Plates. 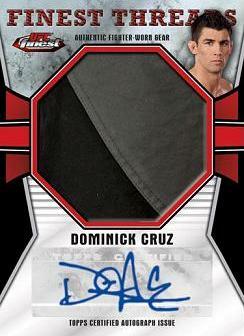 Finest Threads Jumbo Autographed Relic Cards: Combatants sign on over-sized relics (/25). Refractors: All are serial-numbered. Inserted one per pack alongside the following variations: X-Fractors (serial numbered), Gold (/88), Octa-Fractors (/8), Red (/1), Printing Plates. Finest Moments: 25 cards, inserted one per mini-box (two per master box). Refractors (serial numbered), X-Fractors (/88), Gold (/25), Octa-Fractors (/8), Red (/1), Printing Plates. 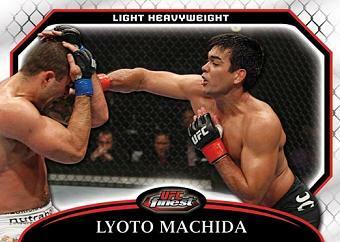 Finest Atomic Refractors: UFC fighters get the spotlight on die-cut Refractors. Parallel: Octa-fractors (/8). 5 star product!The best UFC cards to date! I have purchased 2 boxes of this product and I think it is the Best UFC product so far! 2011 Topps UFC Finest Dustin Poirier Rookie Auto Autograph Champ Card !! !